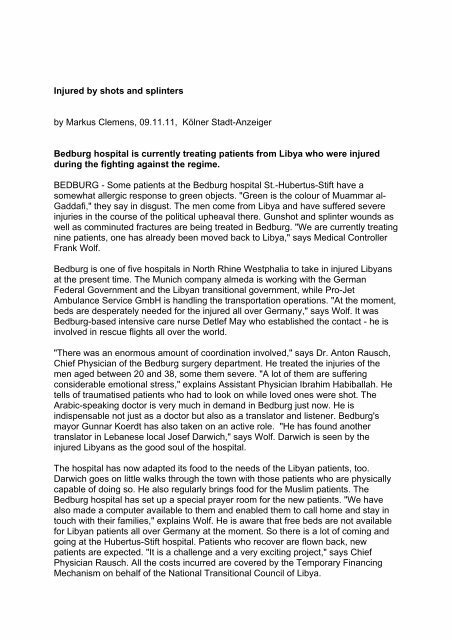 Injured by shots and splinters by Markus Clemens, 09.11.11, Kölner Stadt-Anzeiger Bedburg hospital is currently treating patients from Libya who were injured during the fighting against the regime. BEDBURG - Some patients at the Bedburg hospital St.-Hubertus-Stift have a somewhat allergic response to green objects. "Green is the colour of Muammar al- Gaddafi," they say in disgust. The men come from Libya and have suffered severe injuries in the course of the political upheaval there. Gunshot and splinter wounds as well as comminuted fractures are being treated in Bedburg. "We are currently treating nine patients, one has already been moved back to Libya," says Medical Controller Frank Wolf. Bedburg is one of five hospitals in North Rhine Westphalia to take in injured Libyans at the present time. The Munich company almeda is working with the German Federal Government and the Libyan transitional government, while Pro-Jet Ambulance Service GmbH is handling the transportation operations. "At the moment, beds are desperately needed for the injured all over Germany," says Wolf. It was Bedburg-based intensive care nurse Detlef May who established the contact - he is involved in rescue flights all over the world. "There was an enormous amount of coordination involved," says Dr. Anton Rausch, Chief Physician of the Bedburg surgery department. He treated the injuries of the men aged between 20 and 38, some them severe. "A lot of them are suffering considerable emotional stress," explains Assistant Physician Ibrahim Habiballah. He tells of traumatised patients who had to look on while loved ones were shot. The Arabic-speaking doctor is very much in demand in Bedburg just now. He is indispensable not just as a doctor but also as a translator and listener. Bedburg's mayor Gunnar Koerdt has also taken on an active role. "He has found another translator in Lebanese local Josef Darwich," says Wolf. Darwich is seen by the injured Libyans as the good soul of the hospital. The hospital has now adapted its food to the needs of the Libyan patients, too. Darwich goes on little walks through the town with those patients who are physically capable of doing so. He also regularly brings food for the Muslim patients. The Bedburg hospital has set up a special prayer room for the new patients.  "We have also made a computer available to them and enabled them to call home and stay in touch with their families," explains Wolf. He is aware that free beds are not available for Libyan patients all over Germany at the moment. So there is a lot of coming and going at the Hubertus-Stift hospital. Patients who recover are flown back, new patients are expected. "It is a challenge and a very exciting project," says Chief Physician Rausch. All the costs incurred are covered by the Temporary Financing Mechanism on behalf of the National Transitional Council of Libya.